On February 25, 1836, Samuel Colt received a patent for a “revolving gun” US patent number 138, later known as 9430X. His improvement in fire-arm design allowed a gun to be fired multiple times without reloading. Committed to his revolutionary idea but lacking the funds to patent and produce it, young Sam Colt had tried to raise money touring Canada and the United States for three years as “a practical chemist.” Advertising himself as “Dr. Coult of New York, London and Calcutta,” Colt charged 25¢ admission to his demonstrations and lectured on the recently discovered nitrous oxide, better known as laughing gas. 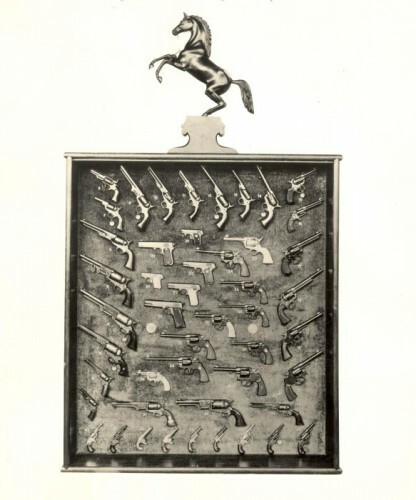 “Colt’s Metallic Cartridge Revolvers - Flickr Photostream.” Connecticut State Library, 2012. Link. Colt, Samuel. Patent Number 9430X - Revolving Gun. X9430. Hartford, CT, issued February 25, 1836. Link.